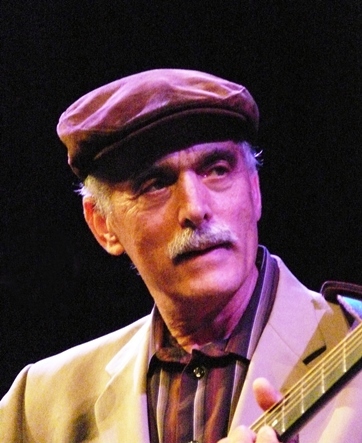 Jim Kweskin’s name has long been associated with the Jim Kweskin Jug Band, which defined an important niche in popular music, showcasing traditional, jugband, and ragtime music in an era (the 1960’s) when more and more musicians were writing their own songs. This band reached back and made music from the past shine. The band spawned the careers of Geoff and Maria Muldaur, and following the break-up of the Jug Band after 5 years, Jim later formed another group, the U and I band. Jim has played solo, as well as with a host of other musicians, including a reunion of the Jug Band a few years ago. His most recent recording, Penny’s Farm, teams him up with Geoff Muldaur and has received great reviews. He created one of the bedrock guitar styles of the folk revival, adapting the ragtime-blues fingerpicking of artists like Blind Boy Fuller to the more complex chords of pop and jazz. He has maintained a remarkably consistent musical vision since his jug band days, continuing to explore traditional folk and blues with the sophisticated sensibility of a jazz musician and jazz with the communal simplicity of a folk artist. In live performance, he has a warm and easy going manner and his fine guitar playing and singing are a delight. Jim will be joined by Benny Brydern on fiddle and Marquis Howell on bass. This will be a great show! His web site www.jimkweskin.com. The show will be in Beckman Institute Auditorium (Little Beckman) and tickets are $20 for adults and $5 for Caltech students and children. Tickets can be purchased on the phone (626-395-4652) with a credit card (a service charge will be added per order), purchased at the Caltech Public Events Ticket Office for face value (Generally open Monday-Friday 9AM-4PM) or purchased at the door for cash or check (no credit cards.) The Caltech Ticket Office is now in their new location at 1200 E. California Boulevard in Pasadena (Southeast corner of Wilson Avenue). Their usual hours are 9AM – 4PM, Monday through Friday. There is limited short term parking in front of the four story Spalding building on California Boulevard (note the yellow curb and the sign that indicates 15 minute parking for the Post Office station inside) Otherwise, you can look for street parking nearby. They are located just inside the door on the east side of the building, to the left of the entrance.